Hauschka finished the season making only 22 of 28 field goals and 25 of 26 extra points. Hauschka made two of his three field-goal attempts in Sunday's loss to New England. Hauschka (hip) practiced fully Friday and isn't listed on the injury report for Sunday's game at New England. Analysis: The Bills never seemed worried about their kicker being ready to go, especially after he worked through the injury in last week's win over the Lions. That said, there are plenty of better options than a guy kicking for a heavy underdog in December weather against a team that typically dominates home games. Hauschka, who was limited Wednesday with a lingering hip injury, was back to a full practice Thursday. Analysis: Coach Sean McDermott has said all along he trusts his kicker will be out there for Week 16, and Thursday's full practice pretty much seals that up. The bigger problem for fantasy owners is the matchup, a road game at New England, a team that's had the Bills' number -- as well as most other December visitors -- for years. Hauschka (hip) was a limited participant at Wednesday's practice. Analysis: Hauschka played through the same injury during last week's win over the Lions and should avoid an absence Sunday against the Patriots if he advances to full participation in practice by Friday. The veteran kicker has converted 20 of 24 field-goal tries this season, with his 83.3 percent success rate representing his worst mark since 2011. Hauschka didn't attempt a field goal, though he did convert both PATs in Sunday's 14-13 win over the Lions. Analysis: Hauschka entered Sunday's game dealing with a hip issue, and while it didn't seem to bother him on his PAT attempts, the Bills did forgo a couple of makable field-goal attempts while choosing to go for it on fourth down. The veteran kicker is 20-for-24 on field goals this season, and he'll look to finish strong against the Patriots and Dolphins in Weeks 16 and 17. Hauschka (hip) is active Sunday against Detroit. Analysis: Despite missing significant practice time this week due to a right hip injury, the Bills never signed a backup option for Hauschka, suggesting his Week 15 status was relatively safe. Nonetheless, there are likely higher-quality kicking options available for the fantasy postseason. Hauschka (right hip) is listed as questionable for Sunday's game against the Lions after logging a limited practice Friday. Analysis: That said, Chris Brown of the Bills' official site noted earlier Friday that Hauschka should be fine for Sunday's game, a notion supported by the fact that he remains the only kicker on Buffalo's roster as of Friday. Hauschka (back) will get "re-acclimated" at Friday's practice, according to Chris Brown of the Bills' official site, and should be fine for Sunday's game against the Lions. 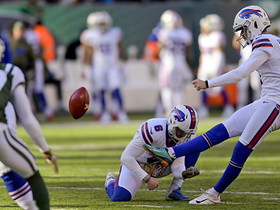 Analysis: Hauschka isn't a great kicking option as he ranks just 21st in standard scoring, but at least the Buffalo offense has finally started moving the ball better and the weather isn't supposed to be so December lousy. Hauschka (back) did not kick in practice Thursday for the second straight day, Chris Brown of the Bills' official site reports. "We're still waiting," coach Sean McDermott said following the session. 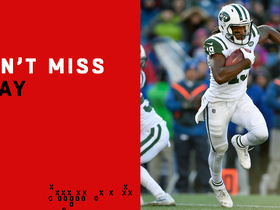 Analysis: Hauschka took a shot as both teams were chasing after a blocked field goal during Sunday's loss to the Jets, a hit the Bills have been complaining about all week. McDermott -- who hasn't brought in another placekicker yet -- still feels his veteran will be able to go Sunday against the Lions, though some form of kicking it around Friday would go a long way toward that belief. Hauschka (back) won't participate in Wednesday's practice, Vic Carucci of The Buffalo News reports. Hauschka suffered a back injury during Sunday's loss to the Jets and is considered day-to-day, Mike Rodak of ESPN.com reports. Analysis: Hauschka was injured following a hit on blocked field goal and said after the game he was fairly sore. His day-to-day designation is a positive sign for his availability against the Lions on Sunday, though we'll learn more when practice reports start trickling through. Hauschka suffered an injury to his lower back and pelvis following a hit on a blocked field goal in Sunday's loss to the Jets, Jay Skurski of The Buffalo News reports. "I was doing my best just to get my foot on the ball," Hauschka said. "It definitely stiffened up my body." Analysis: Hauschka says he's pretty sore and will have a better idea on the severity of the injury when he wakes up Monday and sees how he feels, which is likely to be followed by some evaluation by the team. Hauschka made one of two field-goal attempts and missed his only extra-point try during Sunday's 21-17 loss to the Dolphins. Analysis: Hauschka had not missed a kick since Week 1, so his inaccurate outing Week 13 was something of a surprise. The 33-year-old will look to bounce back against the Jets on Sunday, but his lack of reliable volume in Buffalo's offense makes him an untrustworthy fantasy option. Hauschka converted his only field-goal attempt and all three extra-point tries during Sunday's 24-21 win over the Jaguars. Analysis: Hauschka continues to build upon an impressive season, and he hasn't missed a kick since Week 1. Despite his accuracy, the 33-year-old's volume concerns make him an untrustworthy fantasy option. Hauschka has not yet attempted more than two field goals in a single game once this season. 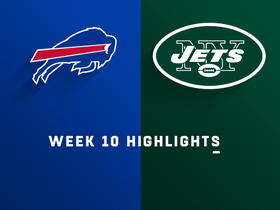 Hauschka hit both of his field-goal attempts and all five extra-point attempts in Sunday's 41-10 pummeling of the Jets. Analysis: The fact that Hauschka had as many extra-point tries in one afternoon as he had from Week 3-10 combined shows you this is far from an offense that yields fantasy production. But for one day, owners that needed to throw a dart got rewarded, as the Bills took control of the game early and cashed in on seven scoring drives. Hausch Money and the Bills get a bye in Week 11 before the Jags visit in Week 12. Hauschka converted his sole field-goal attempt during Sunday's 41-9 loss to the Bears. Analysis: Hauschka did not attempt any extra points, as Buffalo's offense scored only one touchdown and the team elected to attempt a two-point conversion with the game well out of hand. The veteran kicker's only field-goal attempt came on a 41-yard try, which he converted without issue. Despite his reliable accuracy, Hauschka does not receive the volume necessary to provide weekly fantasy upside. Hauschka made both his field-goal attempts in Monday night's 25-6 loss to the Patriots. Analysis: Hauschka converted from 51 and 47 yards, giving Buffalo its only points of the contest. Amid a struggling offense, Hauschka has managed just 43 points through eight games, yet has missed only one of his 20 total attempts. Hauschka made his only kick in Sunday's humiliating loss to the Colts, a field goal from 34 yards. He did not attempt an extra point, as the Bills failed to score more than the aforementioned field goal and a safety in the 37-5 loss. 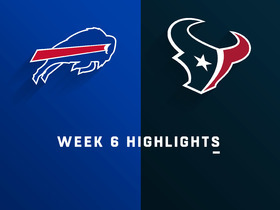 Hauschka made both his field-goal attempts and his only extra-point try in Sunday's 20-13 loss to the Texans. Analysis: Hauschka converted from 23 and 52 yards on his field-goal efforts. The veteran's season tally now sits at 34 points ahead of Sunday's game against the Colts. 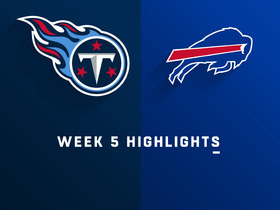 Hauschka hit both of his field-goal attempts -- one from 40 yards and the other from 46 -- and his lone extra-point attempt during Sunday's win over the Titans. Hauschka, who had been working on a scoring streak of 113 consecutive games entering Week 4, didn't even get to attempt a kick in Sunday's shutout loss to the Packers. Analysis: As we've been saying, Hausch Money is a fine kicker, but one that's going to be stuck in an offense with a rookie quarterback and a green offensive line for a while, making him an unattractive fantasy option. How badly did this particular game go for the offense? Hauschka saw the field just one time all afternoon, to kick off the second half with the Bills already well behind. Hauschka made field-goal attempts of 30 and 50 yards and three extra-point attempts in Sunday's win over the Vikings. Analysis: The Bills were once again able to move the ball effectively in Sunday's shocking win over the Vikings and Hauschka benefitted from it. It's yet to be seen whether Buffalo has actually found a rhythm offensively with rookie Josh Allen under center, but as long as the team is able to move the ball down the field, the kicker is a legitimate fantasy asset. Hauschka made both field-goal attempts -- a 43-yarder and a 40-yarder -- and both extra-point attempts in Sunday's loss to the Chargers. Analysis: This was much better output after Hauschka watched his offense struggle all game in the opener against the Ravens and ended up with just three points. Hausch Money is about as accurate as they come this side of Justin Tucker, but we can't hide the fact he's with an offense that may struggle this season, one with a rookie quarterback that faces severe road tests in Minnesota and Green Bay the next two weeks. Hauschka converted one of two field goals in Sunday's 47-3 loss to the Ravens. Analysis: Hauschka's single field goal accounted for all of Buffalo's points in the season opener. The veteran kicker made a 35-yarder and missed a 52-yard attempt. Even though he's one of the league's most accurate kickers, Hauschka may not be a reliable fantasy option in 2018 attached to Buffalo's struggling offense. Hauschka is locked in as the Bills' kicker heading into training camp, Mark Gaughan of The Buffalo News reports. 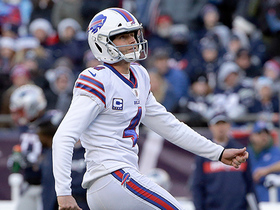 Analysis: Hauschka was excellent in his first season with the Bills in 2017, converting all of his PATs and short field goals while knocking down seven of nine attempts from 40-to-49 yards and seven of nine tries from 50 yards and longer. He ranks fourth on the NFL's all-time list for career field-goal percentage, but his talent may be wasted on a team with a talent-deficient offense. The 33-year-old belongs on the waiver wire in the vast majority of leagues. Hauschka made his only field-goal attempt, a 31-yarder, in Sunday's wild-card loss to the Jaguars. 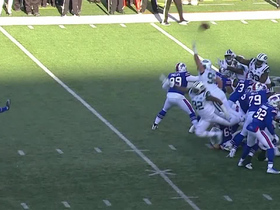 He did not attempt an extra point as the Bills were held to just three points on the day. Hauschka converted an extra point and made field goals from 41, 23 and 30 yards, but missed a 50-yarder in Sunday's 37-16 loss to the Patriots. Analysis: Hauschka's 10 points marked his seventh double-digit effort this season, bringing his tally to 106 through 15 games. Hauschka made his only field-goal attempt and all three of his extra-point tries in Sunday's win over the Dolphins. Hauschka will be kicking in snow and winds up to 19 miles per hour when the Bills take on the Colts on Sunday. Analysis: Hauschka has shown the ability and leg strength to kick through the winds of New Era Field all season, plus the Colts give up more points than anyone. In other words, there's still some scoring to be had for the Bills. Just know that the weather forecast and a rookie starting at quarterback could limit Hauschka's attempts compared to normal game-day conditions. Hauschka made a 49-yard field goal en route to three points in Sunday's 23-3 loss to the Patriots. Analysis: Hauschka was only presented with one scoring opportunity due to the Bills' latest poor offensive performance. The veteran's production has fluctuated greatly this season, as he's gone for four or fewer points five times and 10 or more six times. Hauschka converted three of his four field-goal attempts and his only extra-point try en route to 10 points in Sunday's 16-10 win over the Chiefs. Analysis: Hauschka had 13 points over his three outings prior to Sunday's, so his performance marked a welcomed improvement. On the season, the veteran has tallied 86 points, which is good for tenth among kickers. Hauschka (hip) was a full practice participant Friday and will play Sunday against the Chiefs. Analysis: Hauschka needed a pair of limited practices this week, but he's good to go for Sunday. He only has two missed field goals this season -- both over 40 yards. However, the veteran kicker has been lights-out from beyond 50 yards, drilling all six of his attempts, and each of his last 13 attempts dating back to 2015, an NFL record streak. Hauschka (hip) was limited for the second straight practice Thursday, Chris Brown of the Bills' official site reports. Analysis: Hauschka was rested last week with the issue as well and still played in Sunday's loss to the Chargers. His one field-goal attempt may have been the highlight of the game for the pummeled Bills, as his 50-yarder set a league record for most consecutive field-goal makes from 50-plus (13). It also means his leg can't be bothering him all that much, as it seems to be more of a team playing it smart with a reliable veteran. Hauschka (hip) was limited at Wednesday's practice, Vic Carucci of The Buffalo News reports. Analysis: Hauschka was added to the injury report last Thursday as a non-participant with the same issue, but he returned to a full practice Friday and ended up converting his lone field-goal attempt (from 50 yards) in Sunday's 54-24 loss to the Chargers. His ability to practice in any capacity Wednesday suggests he'll likely be available Week 12 in Kansas City. Hauschka converted his lone field-goal attempt and all three of his extra-point tries en route to six points in Sunday's 54-24 loss to the Chargers. Analysis: Hauschka's six points marked his most over the past three games, a stretch that follows him scoring double figures in five straight. While that evidences Buffalo's recent offensive struggles, which were a big storyline Sunday, Hauschka's 76 points barely sit outside the top 10 league-wide. Hauschka (hip) practiced fully Friday and will be available for Sunday's game against the Chargers. Analysis: Hauschka was added to the Bills' injury report after the sore right hip limited his participation in Thursday's practice, but the kicker's full practice a day later clears up any concern about his health. The 32-year-old has proven reliable when called upon in the kicking game this season, nailing 17 of 19 field-goal tries and all 19 of his extra-point attempts. Coach Sean McDermott said Friday that Hauschka, who sat out Thursday's practice with right hip soreness, should play Sunday against the Chargers, Joe Buscaglia of 7 ABC Buffalo reports. Analysis: That likely means Hauschka will kick during Friday's practice session, so even if he ends up with a questionable designation, it sounds like the veteran will be good to go for the Week 11 matchup. If he does carry an injury designation, Hauschka's status is worth verifying Sunday, given that the Bills and Chargers will kick off following the early wave of games. Hauschka didn't kick during Thursday's practice due to right hip soreness, Mike Rodak of ESPN.com reports. Analysis: It should become clearer by Friday whether Hauschka is dealing with a case of mild soreness or if the Bills simply opted to give the veteran kicker a day off more maintenance purposes. If Hauschka ends up carrying an injury designation into Sunday's game against the Chargers, the Bills could be motivated to sign a kicker onto the 53-man roster before Saturday's deadline for transactions. Hauschka converted his lone field-goal attempt and extra-point try en route to four points in Sunday's 47-10 loss to the Saints. Analysis: Hauschka's stock was hurt by the Bills' struggles offensively. Following five straight double-digit outputs, he's now totaled just seven points over the last two weeks. Hauschka did not attempt a field goal but did convert all three of his extra-point tries in Thursday's 34-21 loss to the Jets. Analysis: Hauschka's only involvement came after each of Buffalo's three touchdowns. It marked the first game in which he didn't attempt a field goal this season, breaking his streak of five straight outings with double-digit points. Buffalo Bills kicker Steven Hauschka has his 43-yard field goal attempt go off the crossbar for a failed attempt. New York Jets wide receiver Andre Roberts dodges multiple defenders for 86-yard kick return. 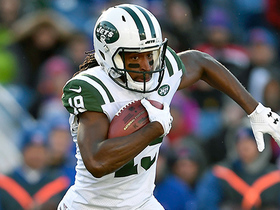 New York Jets wide receiver Andre Roberts breaks loose for 51-yard kick return. 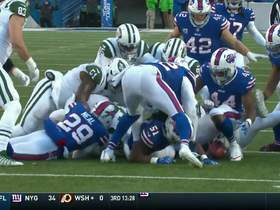 Wild return ensues after New York Jets block Buffalo Bills' field goal attempt. 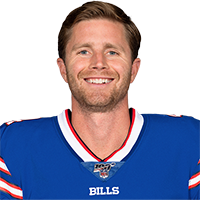 Buffalo Bills kicker Stephen Hauschka makes 54 yard field goal and is now tied at 50 on the NFL's all-time field goal list. 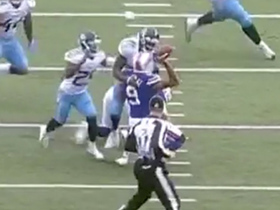 Buffalo Bills kicker Corey Bojorquez feels pressure from Tennessee Titans safety Brynden Trawick on field goal attempt and throws an incomplete pass.